Marcelle, 30, a full-time mum, and husband Justin, 29, a quantity surveyor from London, have a daughter, Jemima, 14 months, who survived on three hours sleep a night until 10 months old. Problem – 10 months old demanding a feed every 20 minutes. It was midnight, we had just arrived home after a long drive and Jemima was crying and still refusing to sleep. Finally I snapped and shouted at her: “Will you just shut up!” As soon as the words were out I was mortified. But for the previous 10 months I’d been surviving on three broken hours sleep a night. Jemima shared our bed – it was the only way we got any sleep – and for the three months previously she’d been waking hourly, crying for 20 minutes and breast-feeding. 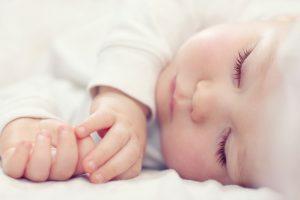 This pattern followed a failed attempt at the controlled crying technique – where you leave a baby crying for longer periods each night until they finally learn to get themselves to sleep. I was diagnosed as having post-natal depression but I knew it was down to the sleep deprivation. I’d count the hours until Justin got home from work so I could hand her over. If he was even a few minutes late I’d scream and shout at him. He was sleep deprived too so our marriage took quite a battering. I lost weight and spent my days on the sofa feeding Jemima with no energy to clean, cook, shop or even go out. My sole goal was to get five hours sleep – if I managed even three I’d phone friends to tell them. It was when I finally lost my rag with Jemima that Justin trawled the internet for a Sleep Clinic and found Millpond’s website. Mandy said that the first thing to do was to move Jemima’s breast feed to before her bath at bedtime and to reduce the breast feeds over night. A healthy baby of 10 months or more, who is eating well in the day, doesn’t need to feed as much as this throughout the night. Part of the problem was that Jemima associated being fed with going to sleep so whenever she woke in the night instead of settling herself back to sleep she cried until I fed her. It was important for her to learn other sleep cues, like a good bedtime routine: Laying down in a warm comfortable cot, a darkened room and a kiss goodnight. The next step was to introduce an evening routine. I was told that when she woke in the night, to slowly, slowly reduce her feeds so that she stopped depending on milk during the night. We decided to keep one night feed for now. Mandy reassured us that this would be hard work but if we stuck to the sleep plan we would soon see progress. She also warned we would be even more tired at the outset. The next stage was getting baby Jemima to fall asleep on her own in her cot using the gentle steps of the gradual withdrawal programme. Slowly we worked through the series of steps set up for us by Mandy to help Jemima get used to happily settling sleepily in her cot. She cried on and off in my arms as I rocked her for 20 minutes on the first night before falling asleep – which was hard – but by the second and third nights it was no more than 10 minutes of fussing. Three days in she was going to sleep without a feed within minutes of lying down and when she woke through the night I quickly resettled her using the steps of the sleep plan. She had begun to understand the routine. Because we used a gentle graduated sleep plan it took about four weeks to complete the process, but I’m happy we did it this way as there really was very minimal upset for Jemima and also for me. Jemima has been sleeping through for almost four months now and I feel like a different woman. I’m finally enjoying motherhood.